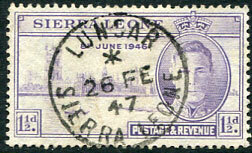 on horiz. 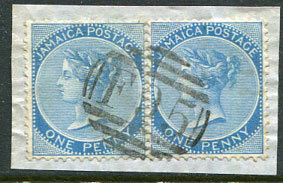 pair QV 1d CC wmk (SG.8) piece. 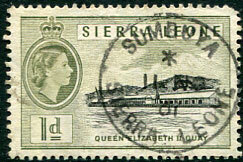 (119.03) */10 DE 58 on QE2 1/3d (SG.218). 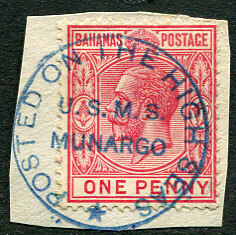 (057.02) C/MR 15 34 on KGV 2d Slavery (SG.171). 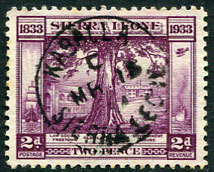 (089.01) */26 FE 47 on KG6 1½d Peace (SG.201). 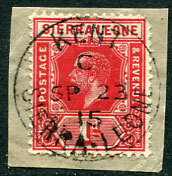 (073.03) C/SP 23 15 on KGV 1d (SG.113) piece). 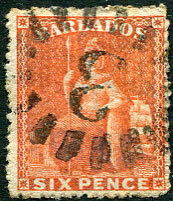 (C2) bootheel on 1871 6d orange-vermilion Small Star (SG.5), slightly oxidised. 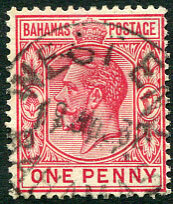 (018.05) C/AP 4 32 on KGV 2d (SG.158) piece. 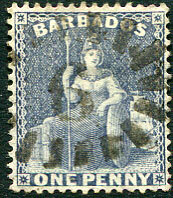 (060.01) */MY 17 33 on KGV 1d (SG.156) piece. (063.01) */18 JU 55 on KG6 2d (SG.191a). (057.03) sideways up C/20 JU 58 on horiz. 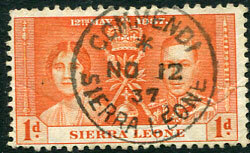 pair QE2 3d (SG.214). 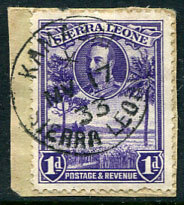 (035.93) */8 FE 56 on KG6 3d (SG.192), rarely found on KG6 issues. 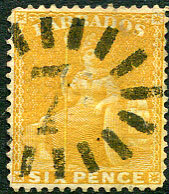 (C2) bootheel on 6d yellow (SG.80), sealed downward tear at top. 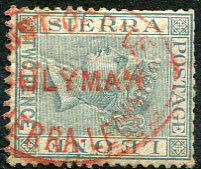 (C2) bootheel on 1d dull blue (SG.73). 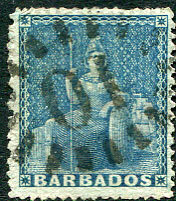 (C2) bootheel on 1d grey-blue (SG.74). 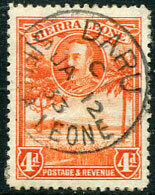 (030.03) C/JA 12 33 on KGV 4d (SG.160). 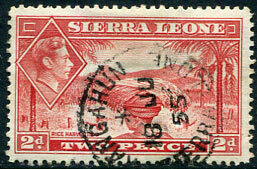 (126.02) C/17 JY 45 on KG6 1/3d (SG.196a). 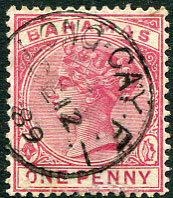 (T.1) sideways down C/SP 26 without year on QV 1d (SG.48), crease top left corner. 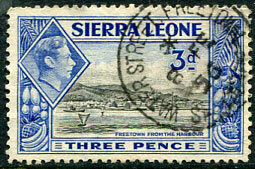 Sideways up and down C code seldom seen on this Type 1 cds. 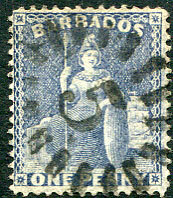 (T.7) 19 JUL 32 on KGV 1d (SG.116). 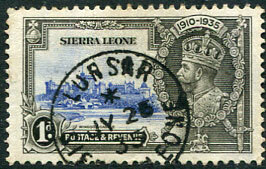 (C2) bootheel on 1d grey-blue Crown CC REVERSED wmk (SG.74x). 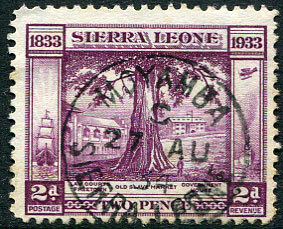 (117.02) C/27 AU 34 on 2d Slavery (SG.171). 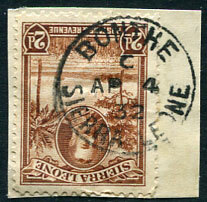 (C2) bootheel on QV 1d (SG.91). 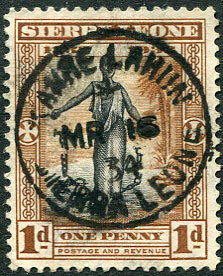 (064.01) */MR 16 34 on 1d Slavery (SG.169). 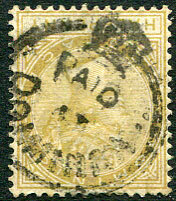 on 1883 QV ½d olive-yellow Crown CA wmk (SG.13). 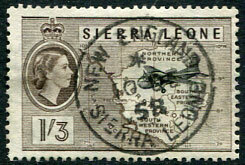 (T.4) A/SP 20 21 on KGV 30pa MCA wmk (SG.87). 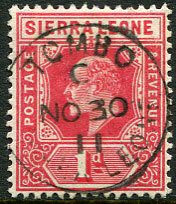 (T.2) A/JA 31 01 on QV ½pi (SG.40). 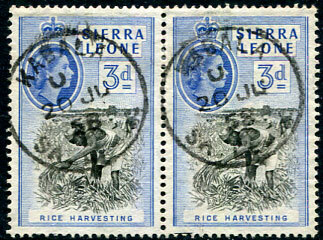 (C2) bootheel on 1d dull blue Crown CC REVERSED wmk (SG.73x). 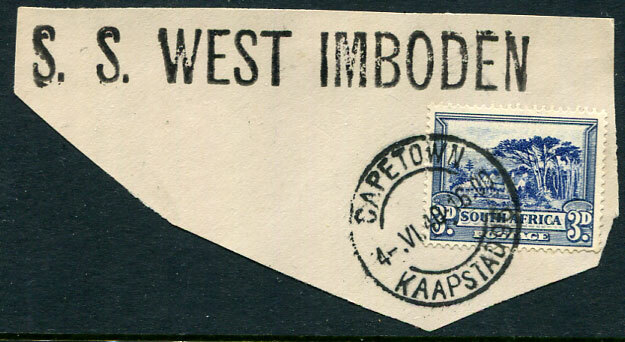 S.S. WEST IMBODEN paquebot handstamp on piece alongside KG6 3d pmk'd CAPETOWN 4 VI 40. 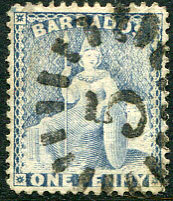 (C2) bootheel on 1874 1d deep blue (SG.74). 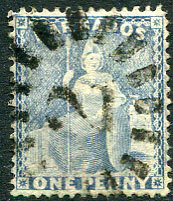 (C2) bootheel on 1861 (1d blue) No Wmk (SG.23). 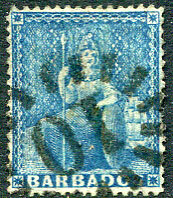 (C2) bootheel on (1d) blue Small Star wmk (SG.52), defective middle right edge, clear part double lined seriffed "PO" marginal watermark (upright and in reverse as viewed from back). 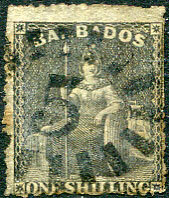 (C2) bootheel on 1871 1/- black Small Star wmk (SG.51), some faults including trimmed perfs. 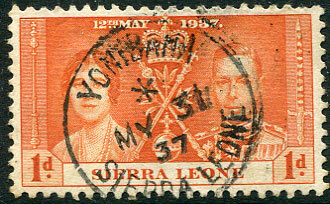 (147.03) */11 NO 61 (new LRD) on QE2 1d (SG.211), blunt corner perf. 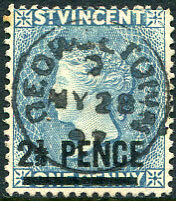 dated reversed C/MY 28 97 on QV 2½d on 1d blue (SG.55a), one toned perf. 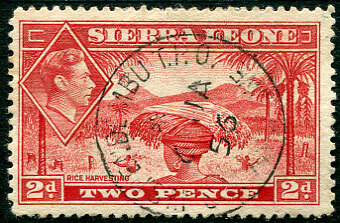 tip. 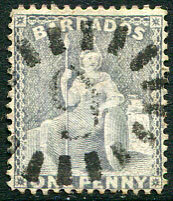 (T.1) C/DE 12 89 on QV 1d (SG.48). 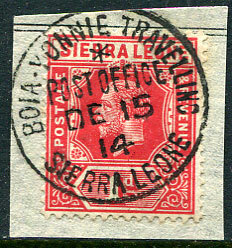 (153.01) on KE7 1d (SG.100). 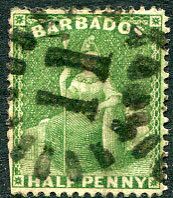 (C2) bootheel on 1876 ½d bright green CC wmk P.14 (SG.72), perfs. 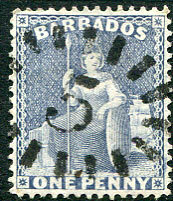 clipped lower left side. 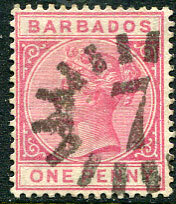 (209.01) */DE 15 14 on KGV 1d (SG.113) piece. 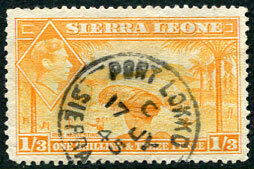 (137.01) C/MR 7 18 on KGV 1d (SG.113). 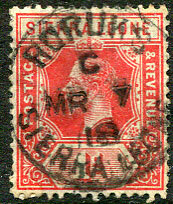 (146.02) in red on QV 2d grey CA wmk (SG.30), some trimmed top perf. tips. 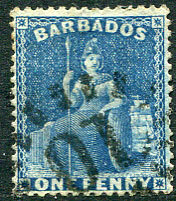 in blue on KGV 1d piece. 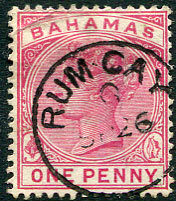 (207.01) */6 JA 56 on KG6 2d (SG.191a), rarely found on KG6 issues. 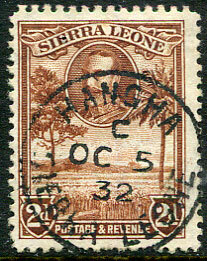 (050.02) C/OC 5 32 on KGV 2d (SG.158).